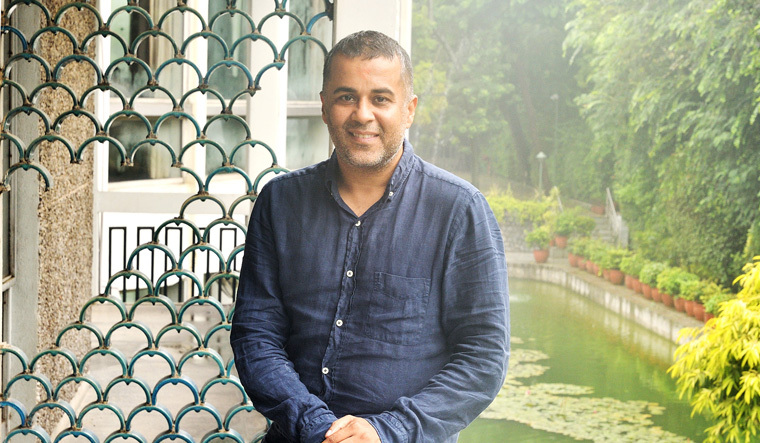 Seated in his room at the India International Centre (IIC) in New Delhi, Chetan Bhagat carefully takes apart a foil-wrapped sandwich, eating just one slice. “No mayonnaise,” the best-selling writer says. Diet and maintaining his weight are just a few of the constants in Bhagat's life, which has recently been in a state of flux. A few months back, he shifted from his long-time publisher Rupa to Amazon-Westland. His upcoming book, The Girl in Room 105, is a thriller, very unlike his usual fare of simplistic yet engaging love stories and signature slice-of-life tales that resonated with millions. The IIC, the bastion of the Indian intellectual liberal, is another constant in his life. It was where Bhagat always chose to stay in Delhi, and his favourite venue for book releases; the latter was a statement for all those who refused to recognise his standing as a writer. In keeping with traditions, the launch of his new book has been set for October—his releases usually happen around Dussehra, the festival season. The book is being marketed differently, with ample stress on the digital. Hence, a mini-movie promo of the book, blockbuster style, was shot by Mohit Suri, featuring actor Vikrant Massey. “A lot of the youngsters are on Instagram, and it is a way to attract them and bring them back to books,’’ says Bhagat. Coming face-to-face with the hurt caused by the prejudices is what inspired him to write the book. While interviewing for a private MBA school, says Bhagat, a young Kashmiri Muslim boy told him in a matter-of-fact manner that he was Kashmiri, but “not a terrorist’’. Says the author, “It was fine with him, which is what makes it sadder. In college, his nickname was terrorist.” It is this kind of mindset, ingrained deep, that Bhagat hopes to be able to change with his book.